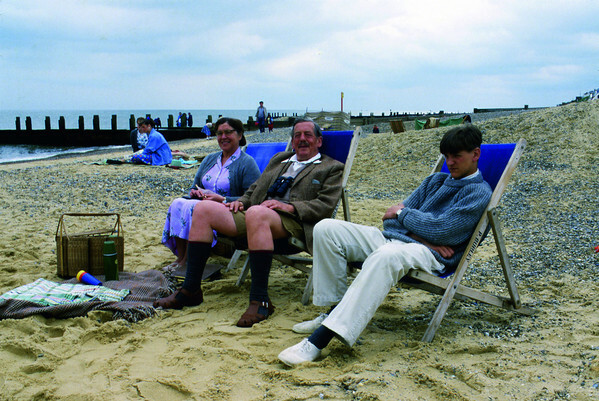 Based on Michael Palin’s own reminiscences of tedious seaside vacations undertaken with his parents whilst growing up in the 1950s, East of Ipswich revolves around Richard, a bored, hormone-ridden teenager who’d rather be anywhere than a sleepy coastal town in Suffolk, accompanied by his tweed-clad father and squirrelly mama. As if the annoying quirks of his parents weren’t enough to contend with, the chosen guest house is run by a draconian ogre, the food is inedible and the weather grim. Thankfully salvation arrives in the form of Edwin, a handsome fellow teen and devil with the ladies, and Anna, a sexually precocious Dutch girl who instantly enraptures our bumbling protagonist with her worldliness and joie de vivre. A subtle evocation of growing pains, post-adolescent awkwardness and the fledgling search for an adult identity, East of Ipswich is hardly laugh-out-loud funny, especially by the standards of some of Monty Python’s preceding efforts, among them Life of Brian (1979) and The Meaning of Life (1983). But it is a well-crafted and gently enjoyable snapshot of life in a bygone age, and a stalwart cast and some affectionate treatment at the hands of Palin ensure the end result is heartfelt enough to sustain interest. East of Ipswich was shot a quarter of a century ago and shows its age. The transfer is clean, with little in the way of artefacts, but the print itself is extremely tired and the image overall quite soft. The audio is also as simple as they come, comprising a single English mono track. It’s serviceable, but hardly spectacular – a little like the feature itself. Madman’s release of this 1987 made-for-television special includes a new 5-minute introduction by Michael Palin, in which he explains the genesis of the project and recounts some of his own experiences of boyhood jaunts to the sea. Palin has described East of Ipswich as the ‘happiest and least complicated creative project he has ever been involved in,’ and it is obvious from this new introduction that he found the entire experience a gratifying one – several decades later he still glows when talking about the project.